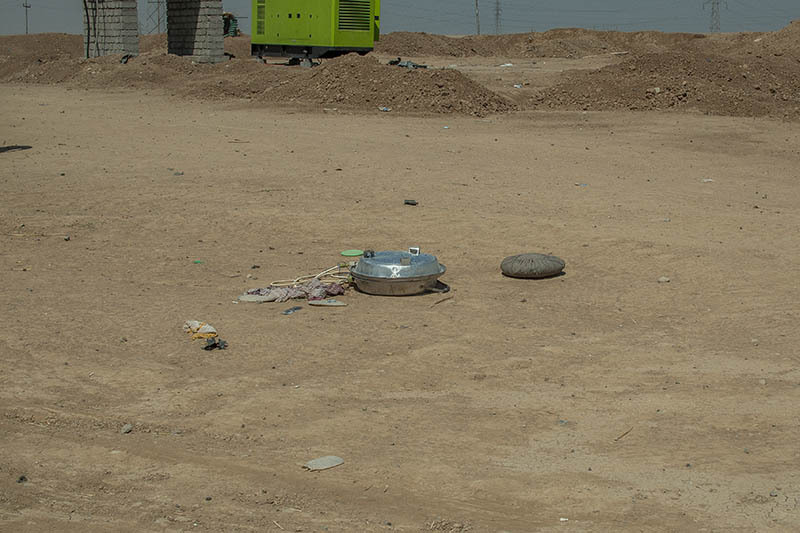 An IED emplaced by retreating ISIS fighters located 10 kilometers from the Mosul dam. Photo © John Beck, August 2014. In recent days several media outlets including the Washington Post and CNN reported that Iraqi security forces and Kurdish Peshmerga encountered landmines, improvised explosive devices (IED), and booby traps during their recapture of the Mosul dam from fighters of the Islamic State of Iraq and Syria (ISIS). As the fighting subsides and more journalists access the area, it is becoming possible to assemble on-the-ground testimony and begin to establish a visual record of the contamination. Aris Roussinos from VICE News confirmed to me that “IED’s were dotted about” as he accompanied a Peshmerga column yesterday. While no pictures of factory produced landmines have yet to emerge from the aftermath of the battle, it is clear that new contamination from a variety of explosive devices has been created by retreating ISIS forces. Because the device pictured has been disturbed by the Peshmerga to make it safe, it is not possible to conclude whether it was constructed to be victim activated. However, given the apparent retreat of ISIS forces from the immediate area of the device, the possibility of it being command initiated is significantly reduced. A prudent assumption can be made that devices like this are initiated by the contact of a person or a vehicle. The Mine Ban Treaty comprehensively bans victim-activated antipersonnel mines, which includes IED’s that can be triggered by the presence or contact of a person such as this appears to be.